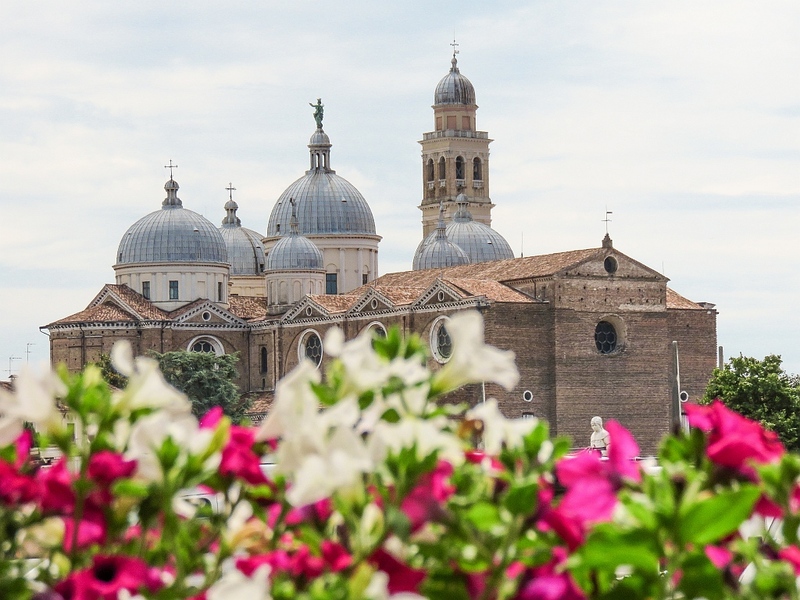 Not very popular among travellers but very much worth the visit, Padua (or Padova in Italian) is a modest Italian city in the province of Veneto that just waits for you to discover it. It doesn’t boast like Venice or Florence with its history or treasures but nonetheless it offers those special little surprises that leave you with the feeling as if you have found your “own” piece of Italy. This 4-day itinerary covers most of the attractions in Padua with suggestions about things to do in Padua and day trips from Padua, including a boat trip on the Brenta Canal to Venice. This post has been last updated on 14 September 2018. Are you interested in short trips? Here you can find more ideas about where to spend a long weekend in Europe. A few years ago my Italian teacher was telling us that many people rush to Venice and just forget about Padua. She told us so vividly about the frescoes of Giotto and the big villas along the Brenta canal, as if she herself had been there. Well, she hadn’t, but passionate story teller she was, she won me to visit this city one day. DISCLOSURE: This post contains affiliate links. If you purchase one of the products directly after visiting this page, I will earn a small commission at no extra cost for you. 1 How to get to Padua? 2 What to do in Padua in 4 days? 3 Where to stay in Padua? How to get to Padua? It’s easy to travel to Padua, you can fly either to the Marco Polo Airport of Venice or to the airport of Treviso. I flew to Treviso and used this site to plan my transfer to Padua. It’s very helpful when it comes to itineraries and public transport schedules. However, at the end my landlord offered me a private taxi to pick me up at the airport, which was quite convenient and absolutely not expensive even if you travel on a budget. I stayed in this beautiful one-bedroom apartment just one block away from the cathedral and right in the historical heart of the city. What to do in Padua in 4 days? Plan half a day to spend on discovering the city, making sure you are walking all those arcaded streets from the Duomo to the Piazza dei Signori, Piazza dei Frutti and Piazza delle Erbe, up to the Piazza Eremitani and all the way down to Prato della Valle. The best way to discover the city is to walk around. Do not forget to stop from time to time to enjoy a cup of cappuccino, or a glass of Moretti if it is an extremely hot day, and observe the passers-by and everyday life. Alternatively, you can take a 2,5 hour walking tour. The Botanical Garden of Padua (Orto Botanico) – one of the most popular attractions in Padua, is the world’s oldest academic botanical garden, created in 1545, and is listed among the UNESCO World Heritage Sites. It has a historical garden and a biodiversity garden located in a solar active building. Do not miss this masterpiece of Giotto (1267-1337) – the father of the Italian Renaissance, one of the first painters who diverted from the flat images of the Byzantine painting traditions. Take a good look of the faces, they are so vivid and full of emotions. I must admit I had the impression that Giotto knew quite a lot of beautiful women. The frescoes in this small chapel are simply mesmerizing. Unfortunately, you can’t enjoy them endlessly, unless you visit the chapel multiple times. You need to book tickets in advance and visitors are allowed in the chapel in small groups, first having to wait in a climate controlled room. The Scrovegni Chapel (the most famous tourist attraction in Padua) is good example of how sites of high cultural and historical value are being preserved in a sustainable way. Let’s be straight on this one: we, as tourists, do our utmost to ruin our monuments by loving them too much. The Scrovegni Chapel is included on the Tentative List of UNESCO World Heritage Sites. Il Duomo is the cathedral of Padua. It took 200 years (1551 – 1754) to build it and the facade has still remained unfinished. It has been initially designed by Michelangelo, but later on the designs have been changed. Enjoy a drink on the square in front of the cathedral. Highly recommended is the Pizzeria al Duomo. If you happen to be in Padua between March and October you should go on a boat trip on the Brenta canal, that’s gonna take you past majestic villas straight to Venice. You can book this trip via my affiliate link on GetYourGuide. The trip is inclusive of a visit to 3 villas (Villa Pisani, Villa Widmann and Villa Foscari, aka the Malcontenta) and you can opt for a lunch. The villas were actually summer residences of the wealthy built throughout the 16th, 17th and the 18th centuries. You can spot frescoes of Veronese or Tiepolo and enjoy the Vitruvian beauty of the Palladio’s architectural genius. The Paladian Malcontenta is another masterpiece on the List of UNESCO World Heritage Sites. Read: Everything you need to know about the Brenta Canal cruise. At the end of this amazing Brenta canal trip a city will open to you with all its beauty and grandeur – Venice. There’s no better way to enter it than from the water. It gives this special feeling of the city offering itself to you, like it did in the glorious days of the Maritime Republics to the sailors arriving there. Venice is not a city for one day but you can make the most out of it in a few hours by allowing yourself to get lost in its labyrinth of alleys and channels. At a certain moment all tourists will be gone in the evening and you will find yourself all alone on a bridge and then you will have Venice all for yourself! And if you fall in love with it you will come back again one day. You can go back to Padua by train. There’s a train each 20 minutes from Santa Lucia train station and it takes about 25 minutes from Venice to Padua. Prices start from as low as 5 EUR per person. The former tower of the Carrarese Castle has been transformed into an astronomical observatory in the 18th century. It’s not very popular sight in Padua, but you can learn quite a lot by visiting it. The Specola (the way the Observatory is called among the Italians) hosts today an astronomical museum. The name of Saint Anthony is immediately associated with the name of the city. Saint Anthony is the patron saint of Padua. The Basilica of Saint Anthony forms a large complex together with the Franciscan Friary (a network of 5 cloisters) and the oratory of Saint George. The relics of St. Anthony are kept in the Treasury Chapel and the basilica is one of the international shrines of the Roman Catholic Church. Il Santo is a must-see in Padua. Do not forget to take a break at one of the cafés across the square where you can enjoy a refreshing gelato feasting your eyes on the church, the square and the statue of Gattamelata, cast by Donatello. Spend some time at the famous Padovan markets hosted on the three central squares of the city: Piazza dei Signori, Piazza delle Erbe and Piazza dei Frutti. Smell Italy! Taste Italy! Sense Italy! And when you just think you’ve seen it all, venture into Palazzo della Ragione, the old town hall of Padua, where on the ground floor you will find numerous deli shops. And just like magic all the stalls will be cleared in the late afternoon and Piazza dei Signori will turn into a big outdoor restaurant with all cafés and restaurants claiming their terrace space under the big tower with the astronomical clock built in 1344. The markets in Padua are so popular, that you can even do a special markets tour. Padua will surprise you. It will cast a spell on you. It will leave you wanting more of it. So that one day you will return to rediscover it, to relive it. If you decide to spend more time in this wonderful city, there are also a lot of things you can do around Padua. Where to stay in Padua? Have you ever been to Padua? What attractions in Padua can you recommend? Leave your suggestions in the comments below! Or perhaps you have questions? Ask below in the comments! So nice seeing in your post Padova! Love places that are void of jammed pack tourists so Padua looks like a nice place to visit. Interesting the Il Duomo is still unfinished. But it’s great that it’s close to Venice too because even though it’s crowded, it’s still worth visiting. Padua looks like a hidden Italian gem that gives such happy feels. I’ve planned a day trip to Venice in August and am considering exploring more of Padua now, all thanks to you! Would love to see the Duomo Cathedral which hasn’t been completed yet! Wonderful post! Makes me wistful. I was in Padua a number of years ago, but it was just a one day stopover between two other cities. I would have loved to get to explore more of the town like you did. I love the idea of “home-basing” in a smaller town like this that is easy commuting distance to the big touristy ones. Great idea! It looks like a very interesting city to visit, specially if we follow your recommendations. I loved the Giotto’s masterpiece too. It’s so beautiful !! I’m heading to Venice in September! I only have a few days unfortunately, but I can’t wait to squeeze as much as I can in. I’m so excited to explore Italy! I’d never heard of this place but it looks really beautiful. I love discovering places that not everyone goes to! Yep, Padua is one of these. I love also discovering new places – like everybody knows Rome, Venice & Florence, that even without actually being there, you feel like you’ve already been – there’s so much exposure everywhere. I’m happy I can inspire people to discover new places. Beautiful pictures and what a fun itinerary. We are going to Venice this summer and almost stayed in Padua! Unfortunately, we didn’t have enough time to explore both cities so we’re just staying in Venice. Hope to see Padua one day. Nice tips ! And of course Vinnies is a must go ;))) I like your photography by the way ! Great post! I’ve been to Italy many times, but not to Padua. I didn’t realise it was such a lovely city! It’s on my list for next time. I can’t believe the cathedral is still not finished though! Yes, Padua is a hidden gem! Padua looks so beautiful! This article really inspired me to travel there one day. You should absolutely visit it! There’s so much to do and see there! One and the same place can be so different of you are 15 or 35 or 55! Yes, in a place like this you can “taste” the Italian way!